What is the Palazzo Ducale? The Palazzo Ducale, or Doge's Palace, is a major landmark in Venice, Italy. It is admired by architects and art historians, and is considered to be an outstanding example of Venetian Gothic architecture. Originally, the Doge's Palace was the seat of Venetian government; it was where the Doge (the Chief of State in the Republic of Venice) lived, and was where the courts and other administrative offices were located. Today, it is a museum. The Doge's Palace inspired the scale model/diorama that is on permanent display at the North End Branch of the Boston Public Library, located at 25 Parmenter Street. 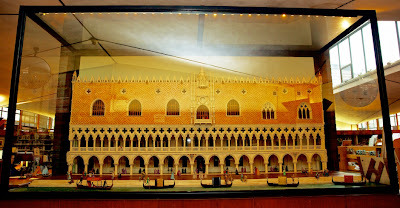 The diorama is composed of the sea-facing facade of the Palace and includes several figurines of historical Venetians; these figurines recreate a lifelike scene from the 16th century. Restoration work, completed in 2013, freshly revealed the model's fine workmanship and exceptional detail. Who built the diorama, and why? Miss Henrietta Gardner Macy (1854-1927), a teacher and an artist, founded a kindergarten in Boston's North End in 1878. She spent several years teaching in that school, and loved working with the Italian children from the neighborhood. Miss Macy also had a long standing desire to see Europe, and took advantage of the opportunity to do so as a European correspondent for several journals. After traveling extensively, Miss Macy settled in Venice, where she lived for the rest of her life. After settling in Venice, Miss Macy wrote many letters to her friends that described her love of the city and its buildings, especially for the Doge's Palace. One summer, while hosting the two young sons of her friends, she built a small model of the Palace to entertain the children. The boys enjoyed helping her build the diorama, and they planned to return to Venice for another visit during their winter school break. Sadly, the boys contracted diphtheria (a serious bacterial infection) at school and died shortly thereafter. Miss Macy was devastated by their deaths, and decided to honor the boys' memory by building a new, larger model of the Doge's Palace. She hoped that the model would be enjoyed by children who were not able to travel to Venice to see the Palace in person. For three years, Miss Macy worked on the Doge Palace model in her spare time. As it neared completion, art collectors and museums showed an interest in purchasing the model, and Miss Macy accepted an offer from the New York Metropolitan Museum of Art. When it was finished, Miss Macy made arrangements for the model to be shipped it to New York. The model made it as far as England, where, while it was being temporarily stored in a warehouse, a fire broke out and it was completely destroyed. Miss Macy began work on another model of the Doge’s Palace with revised and improved plans. Again, she worked in her spare time, and spent several years working on the second model. Again, many people expressed an interest, but no one would guarantee purchase until the work had been completed. When Miss Macy died in 1927 at the age of 73, the model was still unfinished. How did the diorama get to Boston? After Miss Macy's death, her friend Miss Nina C. Mitchell hired craftsmen to finish the Doge's Palace model as a memorial to Miss Macy. The completed model was then presented as a gift to the North End Branch of the Boston Public Library for the enjoyment of the neighborhood, including the descendants of those children whom Miss Macy had taught in her North End kindergarten. Who do the figurines represent? Other figures in the diorama include Franciscan monks, foreign merchants, a beggar wearing a black hood to hide his identity, peasants coming from the market, and a young man carrying a marriage chest.